I have a reasonable guess as to what the third book will be called, but I’ll keep my thoughts to myself. These concrete sequences has the benefit of being true and useful in orienting yourself if you happen to find yourself or your institution under assault by today’s would-be omnipotent moral busybodies. For having “written the book on rhetoric,” this did not strike me as being particularly persuasive, or likely to be persuasive to casual readers. I had loaned my physical copy of SJWAL to a family member who worked in academia, in hopes that he might find some of the principles useful. In the end he did, even forwarding some page-scans to colleagues who were under fire, but it was difficult for him to find totally compelling because the section about John Scalzi made Day seem like a jerk. It should not be terribly difficult for an author — especially one as smart and technologically savvy as Day — to do the research and learn about other situations well enough to describe them in a book. Fortunately, Day’s own experiences are less of a centerpiece in SJWADD. 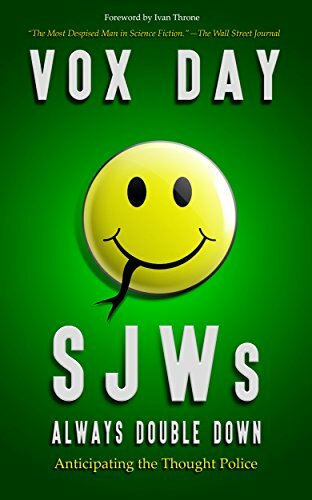 The book features a magnificently vicious email sequence from an unknown SJW (but whose voice is suspiciously reminiscent of Randi Harper) to an open-source code project-manager; the decline and fall of a Lutheran church in the suburbs of Minneapolis; a thorough account of the James Damore meltdown, and other interesting and amusing anecdotes of Social Justice convergence. These stories are often familiar — in form, if not in detail — to veterans of GamerGate and to the Alt Right, but they are often less familiar, or only peripherally familiar, to the less politically involved reader. As Day points out early in the book, the zenith of SJW antics was in 2015. In 2016 and after the rise of the God Emperor, even a regular viewer of mainstream television news is at least acquainted with events in which normal people are publicly slaughtered by SJWs. They may not know them by name, but average Americans are learning what a Social Justice Warrior is. For the veterans of Social Justice tactics, there are technical aspects which Vox Day introduces, namely a breakdown of the psychology of Social Justice Warriors, as well as a rather technical and exhausting list of logical fallacies and strategies that they often utilize. SJWAL broadly avoided the task of psychoanalyzing leftists, so the fact that Vox opted to take on the job here suggests that the third and final book in the series might address the question of how we might attempt to cure people of this brain cancer. On the whole, SJWs Always Double Down is an informative and practical book. But it is not a classic like SJWs Always Lie, and, in my opinion, is not a “must-read” for ordinary people going to work and school in the way that SJWAL was. But for activists and those of us more deeply involved in protecting, recapturing, and re-forging institutions of Western Culture, its insights are unique, clear, and actionable. And as more people get smart to the fact that Social Justice Warriors always lie, the number of culture guardians may grow much larger in the near future. 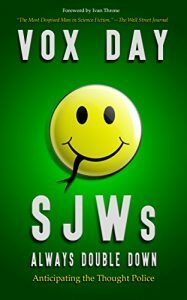 Published: November 6, 2017 | This entry was posted in North American New Right and tagged book reviews, C. B. Robertson, North American New Right, originals, political correctness, SJWs Always Double Down, social justice warriors, Vox Day. Both comments and trackbacks are currently closed. SJWs don’t lie when the truth serves their agenda. But they always lie when the truth doesn’t serve their agenda. Is it not dishonest to claim that ‘SJWs’ always lie? Not really. They lie because they have no connection with the objective world. They lie because they live in a self constructed world of made up fantasies. They do not mean to lie, its just that when they occasionally speak truth that is more a matter of coincidence than of shared world views. The very idea of mass higher education for all who wanted it was hubris with this as the likely if not inevitable result – since most of the people there have no business being there. Thus they were made money off of as tuition bearing animals, and beyond that, the most promising were trained as “educated cadres” of Political Correctness, the Western form of Communism. The ones in Gender Studies go a step beyond that: they are Priests of the new order or whatever the non-gender specific variant of that word is or will be. But it seems we are embarked upon the road to once more enshrining group rights founded upon ethnicity and confessional considerations. Without wishing to sound like a Libertarian, I would ask: is that a good thing? Oh, I’m afraid we embarked upon that road some time ago. Whether it is good or bad is irrelevant, we’re stuck with identity politics whether we like it or not. Of course, identity politics is rarely an issue in a monoracial society and thus whites have been caught off guard. We’re now beginning to learn that we cannot have a truly liberal individualist society in a multi-ethnic multi-cultural country. Well, that is the function of George Orwell’s 2+2 = 5. Though he does dive a little into the “mechanics” behind SJW-ism, i.e. why the SJW becomes an SJW, I do find that part a bit lacking. That alone was worth the price of this book to me.